Guess what?! Chapters said “no” to me the first time, and the second time, I brought my book to them. 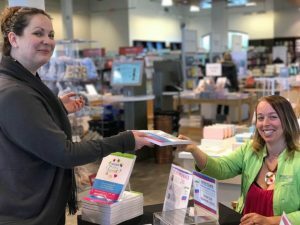 Me, Amber, selling my book at Chapters! Okay. Okay. Nobody actually yelled that at me, either time. But at the moment the words were said, I certainly felt as small as one does when somebody yells at them. This meant I had to really take my own advice and use my Success…With A Twist System on myself. Darn, it’s so much easier to teach and preach it, than it is to get down and dirty with it! They say that you teach most what you need to learn. This meant it was time for me to put into action the very system we teach to all our families! I’d love you to feel the same way I do about being able to accomplish whatever you put your mind to! In this case for me, it was to get my book into Chapters. In essence, I’d like you to get TWISTED about things you are really passionate about too! The Twist is the system I have used for years personally and professionally. It works for all areas of your life and it’s repeatable. I invite you to continue to read how to apply it through walking with me through my book challenge. I’d love to hear from you as to what you are working towards and once you use the twist, how it worked for you! So, here is a walk through my world… it follows the icons in the Tutoring…With A Twist logo for those of you that are visual! With getting this little glimpse into my world, I’m hoping you can see that it’s not all rosy. I too hit bumps, sometimes even more than two times, and choose to get back up again. 1. Happy Face – Happy…Just Because! The line of success is not straight and not without its intense moments. Sometimes it’s caused by our own actions and reactions and other times by things out of our control. Life is just like that. When you shift to being happy…just because, you won’t be waiting for somebody else’s approval to be happy! I have to remind myself that I’ve set an intention in life to be happy…just because. So, no matter what, I’m not going to allow another’s thoughts or actions, to affect my happiness. Well, check this one-off right off the bat! I had to talk to my inner child that was feeling rejected when Chapters said “No! !” …twice! Hmm…I just birthed a book baby and it was rejected. Of course, the Mama Bear in me wanted to come out and defend it. However, really in essence, I felt rejected. A tip here is to remove how personal something feels and make it more objective. There are guidelines that are causing this person to say no. Let’s dive into what those guidelines are, instead of staying stuck in the emotion. When we get stuck in the emotion, we will typically blame, as well as defend, all in an effort to be right. I didn’t want to be right. I wanted them to say “YES, we will take it!”. 2. Star – Your Hopes, Wishes, Dreams & Desires! Think of the dreams, goals, wishes, hopes, and desires you have for yourself as represented by stars. 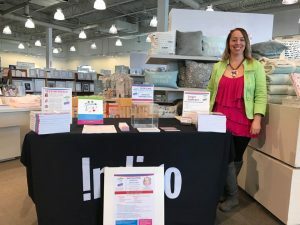 In staying true to the dream of having my book in Chapters, I needed to be crystal clear on why it needed to be there. If I wasn’t clear on this, how could I expect anyone else to be? What was my why?! Did I have enough conviction in it to withstand being rejected twice?! 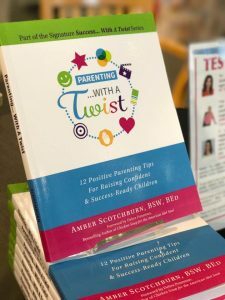 The Parenting…With A Twist book fills a gap in the parenting niche. People often say that there isn’t a manual that comes with having a child, I’d like to suggest that now there is! This book was written in that it could be read in its entirety or one could simply reference the index for what issue they are wanting more information about. The book is written from not only an educated place but a place of passion and experience. Along with having four children, we’ve also had many homestay students that have been adopted as our children. With being an educator for twenty plus years, I’ve also worked with a number of children and their parents. 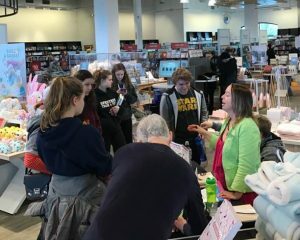 As I’m not able to service the same amount of people that stores can, my book getting into a chain like Chapters helps more people. Also, there is a term called social proof. Social proof is evidence that people have liked and trusted something. In this case by having my book in Chapters that recognition lends automatic credibility to my book. My book could be the best book EVER, but without social proof backing that up, it’s not generally accepted that it is. I’ll digress for a minute to tell you a story to illustrate how I first learned about social proof. There was an orange traffic cone on a sidewalk in old Vegas. People started to line up at this cone. Others followed suit. Soon there was a line up down the street and around the corner. As people joined the line, there was talk of the line up being “about an hour and half wait” from that particular point. The first people that lined up were lining up just to prove that social proof existed. They were not lining up for an event. They were lining up simply to proof that people follow a crowd mentality. Oh! We must line up because “something” is happening. Therefore, even though I received a no, that didn’t change my intention to get into the book store because my whys were very strong. I created them and I believe in them. I was going to reach my star which represented my dream of having my book in Chapters! 3. Circles – Teamwork Makes the Dream Work! The circles represent the lenses that we look through in life. You will notice that some overlap and others don’t. With the intention of getting my book into Chapters, I have to be aware of where my lens is the same as those in the position of power at Chapters and where it differs. As well, I had to be aware of their intentions too. So, yes, I had to be open to hearing the good, bad and the ugly about my book. Some refer to books as babies; so imagine, I had to hear and be okay with hearing, the good, bad and the ugly about my baby! I also needed to let my defences down so that I could truly hear another’s viewpoints on my book and seem them as just as valid as mine. My first meeting with Chapters lead me to talk with the lovely Store Manager and this is what I learned! For Chapters, it was important to have the book be seen as credible. Considering anybody can self-publish a book and my book was self-published, their question was: what makes my book legit? Chapters also liked to have a Press Kit with the book. I did not have one. I asked to see an example Kit. 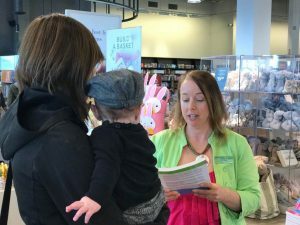 When Chapters hosts events, they want to ensure that the author will show up at the event, as well as participate. In other words, not sit behind their table, using it as a shield, but actually, get out in front and talk to the customers! 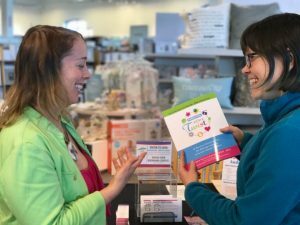 All of this said, the Store Manager, while having the authority to say “yes”, is much more willing to saying “yes” if the National Manager is on board. I got his information! -talk to the National Manager. In our home, we have changed the spelling of the word “mistake” to “miss take”. Thereby, legitimizing failure. Life need not be based on perfection when you change the mindset that learning does require miss takes. It may take from “Act 1 -Take 1” to “Act 1 -Take 101” to reach a goal. I like to do my best to make it less than 101 Takes ;)! As I don’t look at failures as something bad and instead look at them as “miss takes”; I know that I need to make many “miss takes” on my life journey to get what and where I want to. To illustrate this point, I always like to tell people to think: what if we didn’t learn to walk until we were adults?! Think of how many of us would in actual fact, NOT be walking. When we are learning to walk as infants, we are encouraged to make miss takes because everybody wants us to reach that eventual goal of learning to walk! As we go through childhood, so much of that enthusiasm for failure is lost. Signing my book for a fan! So, my first visit into Chapters was “Act 1 – Take 1” of the movie, “Amber Gets Into Chapters!” Not to give away the movie’s ending, but to let you in on a little secret, this movie had more than one take ;)! walk to the National Manager through all of above to get his approval. And, I did all of those things! -I ensured my professional credentials such as my Bachelor of Social Work and my Bachelor of Education were on the book. My forward was written by a Chicken Soup for the Soul author, Debra Poneman. As well, my book was officially endorsed by a New York Times Bestselling author, Marci Shimoff. -I created a rather impressive Press Kit, even if I do say so myself ;)! Check it out here! -The Store Manager called and offered me to come in to do an event. She let me know that I needed to be aware that my book was NOT being accepted, but that I could bring copies on the day of to sell. I accepted! This was just like an audition for my movie: “Amber Gets Into Chapters!” This was my opportunity to show that I could be personable. I was excited that they wanted to take a chance on me! I sold a record number of books that day and the only time I sat down was to autograph books! -I spoke to the National Manager after doing all of the above and he gave me his endorsement. He did suggest that it was up to all the individual stores as to whether to take me. However, I was able to use his name as an “in”! 5. Litmus Strip (PH Level) – What Are You Passionate About? Passion gives us all a reason to stay motivated, especially during tough times. It also strengthens people’s “why”. Instead of simply seeing as something they “have to do”, they will look forward to doing it. I love to exude my passion. Is it also about making money? Well, of course. If you are in business for yourself and don’t want to make money, you need to be working for someone else that does! Because I want to make money while living my passion, the two need to be married. As cliche as it may sound, more often than not, work doesn’t feel like “work”, it feels like I’m doing what I’m called to do every day! Me (Amber) and a student with my book at Chapters! Passion also makes rejection okay. Passion also makes rejection okay. Again, think of that baby learning to walk. Every time they fall, every single time, they are rewarded. They are rewarded with laughter, claps, encouraging words, kisses, hugs, people rushing to make sure they are okay and the list goes on. Why do we allow this celebration of failure to stop as we get older? I’m not going to stop because of rejection, and I’m going to learn from it so that my passion can win. I’d also take laughter, claps, encouraging words, kisses, hugs, and people rushing to make sure I’m okay! I also really enjoy chocolate and peanut butter ;)! When I did the event for Chapters, I went in as though I was an already established author that was having her own book launch. I did not consider myself an “add on” or even worry that my book wasn’t already in the store. I had accomplished a major leap in the right direction. I was in Chapters with my book. Me, Amber Scotchburn! The person who a couple of months before didn’t even have a book and a couple of minutes before that had been rejected by Chapters! You could probably have seen my glow that day from the moon ;)! 6. Heart – You can do it! Our heart keeps on beating no matter what situations we go through. And we want this, because otherwise, what’s the alternative?! It’s usually our brains that hold onto experiences that cause us to think that we “can’t” do something. Therefore, we need to stop believing everything we think! Take a look at your limiting beliefs and choose a path to create new thoughts that you can do “it”…whatever it is. I need to believe that my life up to this point has prepared me for this experience. My heart has never stopped up to this point, so why should I? My first degree and career were in social work. I worked with mainly teens that had some significant life challenges. Some were mandated, read forced, to come and see me. Some of those that were mandated weren’t happy to be there. It was my job. Scratch that, it was my mission to re-engage them in life, one step at a time. When I was choosing a career path beyond social work, I looked at teaching. I was thrilled that the experiences I had in social work would perfectly lend themselves to being in a classroom. When I was in my early twenties, I was teaching at a very large high school. I looked younger than some of the students and was certainly shorter than a lot of them. Guess what? I captured their attention. I went on to teach mainly at-risk youth who are a little bit of a tougher crowd to engage. My passion got me out of bed every single day to make a difference. 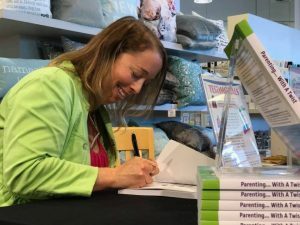 These years of teaching prepared me to stand in the front of a store and share my book! Complete strangers had nothing on a group of teens that had some anger issues ;)! In my first year of teaching, I taught a pilot subject. This meant there were no textbooks or curriculum designed for it yet. As it went from being a pilot subject to being a compulsory subject across the province, I was asked to go around and train teachers, principals, and superintendents on the merits of the course and the way in which it was taught. Imagine their surprise when a 12-year-old came in to teach people who had been in the system for over 30 years how to look at education. Ok. Ok. Maybe I didn’t look 12, but pretty close to it! Twenty years later in Chapters on a sunny afternoon, I channeled that person who had walked into a board room full of strangers with over 30 years experience. I stood confidently and firmly rooted in my knowledge, passion and what I believe to be true! I had a lot of life experiences that prepared me to break through the paradigm of “she only wants to sell me something” when people walked into Chapters that day! 7. Amber Caution Sign – Do you use caution as you proceed through life? Our Twist helps someone to assess how they are acting, thinking, behaving and being on their path to their life goal! We help them to decide what thoughts, actions, and beliefs are best serving them and which they need to change. Remember the star? Remember the confidence that you need to reach your star? This step is where the magic happens as there will be no stopping you! This is where I needed to ask myself the tough questions before moving forward. -Am I truly ok with the fact that Chapters told me “no”? -Did I want to change my goal? -Was I open to hearing and understanding their reasons for the rejection to affect a different outcome? -After making sure that I was clear on what they needed from me, was I able to act upon their objections? -Did I take action in a timely fashion? -Did passion and my experiences to date get me beyond the rejection? -By approaching them again, am I respecting their “no”? Operation “Amber Gets Into Chapters”, Act 1, Take 101 in play! 8. Target – Does your child set goals & make a plan to reach them? The goals we set are important. Adding a timeline to your goal keeps you on target. When you have something to measure, you can see if you get to your desired place. Essentially, what do you do to stay on track to reach your goals? Life is made up of a series of choices, each with a price and a benefit. Nothing more, nothing less. By realizing this, we can understand how simple life truly is. If a behaviour isn’t serving you, address it. If a behaviour is serving you, reward it. If you don’t make these adjustments, life’s natural consequences will make them for you. I state that the Twist guarantees success. While saying that, I had better not only believe it but be able to prove it. So, here’s my proof in the form of a spoiler alert: I reached my goal. When I don’t, I need to be okay with examining why that is and how I’ll move forward from the experience. I learned more in my—not one, but two—“no” conversations with Chapters, than in all my “yes” conversations combined. So, did I meet my goal the first or second time? No! Did I learn a hell of a lot? Yes! 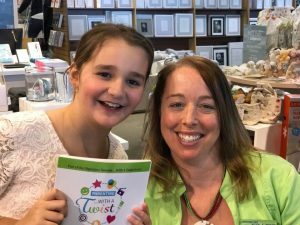 I hope this little glimpse into one of my experiences with The Twist helps you get through something you are going through. You TOO can reach your dreams and do anything you put your mind to!